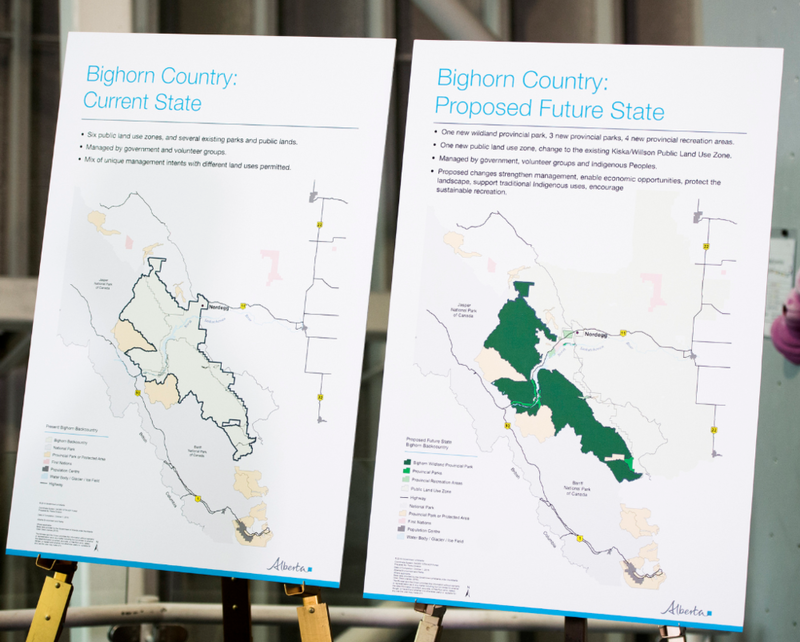 A year ago, the Alberta Government sought input on the creation of a land management plan for the North Saskatchewan River watershed. The ACC asked our members to give us input on how they recreate in the area, known as the Bighorn Backcountry. We knew that the area is of great importance for self-propelled recreation such as hiking, rock and ice climbing and mountaineering. The Kootenay Plains area of the Bighorn Backcountry. Photo by Adam Linnard, supplied by Love Your Headwaters. We collected the voices of our members and passed them onto the Minister of Environment and Parks Shannon Phillips and Premier Rachel Notley. We know that the area has both important environmental and recreational value and we stressed to the Premier and the Minister the importance of the protection of the area, while preserving access to low-impact recreation. The area includes the headwaters of the North Saskatchewan and Red Deer Rivers and key habitat for numerous species of fauna including some at risk species. It is also home to the famous ice climbing along the David Thompson Highway, sport climbing at Kootenay Plains and Mount Stelfox as well as extensive hiking, camping and mountaineering throughout the area. The plan for the parks and protected areas recognizes the importance of recreation and tourism. Lael Parrott, ACC Vice-President of Access and Environment reviewed the Government’s plan and noted that it was aligned with the ACC’s priorities in both conservation of alpine environments and recreation and that the ACC supports the proposal. Now it’s your turn to offer input for each of the area’s proposed parks and wildlands in Bighorn Country. The government is currently surveying Albertans for their input on the proposal, and is encouraging input through an online survey. Input is sought on how the proposed parks and public lands could be managed and which activities would be appropriate in each. The survey takes between 5 and 10 minutes to complete, and it is accompanied by maps and details of each of the wilderness and park areas. We encourage all of our members in Alberta to review and complete the survey. Mountains need stewards now more than ever. It has never been more important for the ACC to have the resources to lead initiatives to ensure Canadians can access alpine environments – safely, affordably and responsibly – while providing leadership in conservation, responsible use, education and scientific studies.